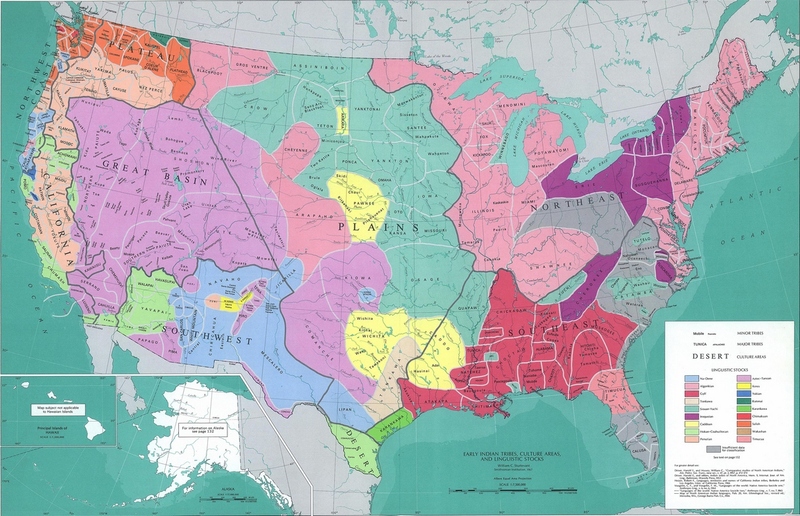 (About) Large, high resolution map of early Native American Tribes. See also map below with enhanced legend. Most Oklahomans identify with the Five Civilized Tribes, the Cheyenne, the Comanche, and other contemporary Native people of our state. Representing approximately 8 percent of Oklahoma's population, they are frequently discussed in historic accounts of the settling of Indian Territory. However, other less-well-known Native people inhabited Oklahoma for many thousands of years prior to European arrival on the southern plains in the mid-1500s. The Wichita and the Caddo can be traced back in prehistory at least two thousand years, and the Osage and Apachean-speaking people can perhaps be documented here prior to the arrival of Europeans. Other groups with no historic tribal connections may have lived here or passed through beginning some 30,000 years ago. Prehistoric groups demonstrated remarkable adaptability to diverse settings and changing environmental conditions across Oklahoma. The archaeological record in some 17,500 sites offers evidence for the presence of prehistoric or early historic people over an incredible expanse of time from perhaps 30,000 years ago to as recently as the Dust Bowl era. Within North and South America's archaeological community, a heated debate concerns the Early Arrivals who first peopled the New World. For many years conventional wisdom held that "Clovis culture," existing here approximately 12,000 years ago, represented the hemisphere's initial immigrants. Scholars generally also accepted the idea that Clovis culture was the primary pulse of early settlement. However, recent work with mitochondrial DNA as well as historical analysis of the evolution of Native American languages brought forth suppositions that peopling of North and South America extended back in time some 20,000 to 30,000 years ago and potentially reflected a number of separate arrivals. The pre-Clovis argument was bolstered in southern Chile by a fourteen-thousand-year-old settlement called Monte Verde. That it bore no resemblance to Clovis culture brought credibility to the pre-Clovis argument. During the mid-1980s and 1990s, archaeologists reported numerous sites that strengthened the argument for early and multiple immigrations to the new world. Identifying these sites proved fairly difficult. Because Clovis had long been recognized as the first inhabitants, discerning exactly what would comprise a pre-Clovis site presented a significant problem. Another issue concerned the survival of these early arrivals. Obviously, Clovis culture reflected a successful immigration. What if some or many of these attempts 10,000 to 15,000 years prior to Clovis were failures? Oklahoma's archaeological record has played a significant role in helping answer at least some of the questions about Early Arrivals and pre-Clovis settlement. In two locations credible evidence for pre-Clovis settlement exists: the 18,000-year-old Cooperton mammoth remains in Kiowa County, and the Burnham site in Woods County with a suite of relevant radiocarbon dates ranging from 28,000 to 32,000 years ago. Both locations hold material associated with extinct Ice Age animals. What the sites lack, however, is the clear continuity and unquestionable context found with Clovis culture sites. Because of the uncertain context and the absence of comparable sites around Oklahoma and the region, archaeologists have difficulty characterizing these peoples' ways of life. The Early Arrivals were explorers at the edge of new frontiers, and their motivations, the nature of their society, and the full implications of their actions may never be fully comprehended. Debate about the peopling of the new world will undoubtedly carry forth, each school with its ardent supporters. Resolution of the question may 8come in the near future as dating technology becomes more precise and methodology improves. The next period, the time of Early Specialized Hunters, refers to our earliest well-documented inhabitants, known in the literature as the "Clovis and Folsom cultures." Clovis people occupied Oklahoma around 11,000 to 12,000 years ago, while Folsom occurred somewhat later, around 10,000 years ago. Both are viewed as specialized hunters, not so much for what they hunted but for manner in which they hunted. For example, Clovis groups hunted mammoths as well as a variety of other game, whereas Folsom people specialized in hunting giant, now-extinct bison (Bison antiquus). Stalking and killing mammoth or giant bison, large and potentially dangerous game, was not a capricious activity; it required complex knowledge and strategy far beyond that needed for hunting deer or other modern game (with perhaps the exception of bison). Both societies used well-designed, chipped-stone tools. Their spear points, in particular, reflect special craftsmanship. Other weapons, tools, and possibly ornaments were made of ivory, bone, and wood. Because of the hunting emphasis, Clovis and Folsom technology technology might not have been as expansive as that of later peoples. The Early Specialized Hunters were nomadic groups who moved from one favorable location to another in search of game and perhaps edible plants. In Folsom's case, their movements were very likely dictated by bison herds' distribution and migration. Although these groups are generally thought to have lacked complex social or political organization, some individuals (perhaps elders) must have provided information necessary for decisions about when and where to relocate, who would participate in the hunt, and how to meet basic group needs. Evidence for Early Specialized Hunters is sparse and widely distributed across Oklahoma. While artifacts of Clovis people occur throughout the state, Folsom materials are restricted to the Southern Plains or the western part of the state. Because of the great passage of time, few finds occur in a stable context; they typically appear on eroded surfaces or are washed into river beds. Our only well-documented Clovis sites are Domebo in Caddo County, where a group/band of these people killed an Imperial Mammoth some 11,800 years ago, and Jake Bluff in Harper County, a bison kill. Two Folsom sites are present in Harper County in northwest Oklahoma. The Cooper and Waugh locales respectively represent a bison kill and a possible camp. After some fifty years of searching for sites of specialized hunters, archaeologists have discovered these four places and few other locations. Between approximately 9000 and 4000 years ago, various Native peoples termed Hunters and Collectors occupied Oklahoma. Hunters and Gatherers and Late Mobile Foragers are among the designations cataloguing these peoples in past literature. Following trends that began with Dalton culture, hunting of game continued, but emphasis began to shift toward collecting edible plants. Although the Hunters and Collectors remained quite mobile, they were probably less so than the more specialized hunters that had lived at the end of the ice age. Existing in an environment much like that of our time, Hunters and Collectors moved their settlements from one seasonally available set of resources to another during the year. Diversified resource use contributed to a more expansive inventory of weaponry and tools, especially tools related to plant procurement. Group size was probably quite fluid, the size of the group dictated by resource availability as well as by tasks at hand. However, this "mapping on" to seasonal availability of food resources also required greater group coordination and undoubtedly led to increasing concentration of decision-making authority in the hands of some individuals. This era also presents the first available evidence for concepts of an afterlife, represented by planned burial and special treatment of deceased group members. Ironically, the best evidence for people living during this time in Oklahoma's past also occurs during the period of greatest climatic hardship, the Altithermal. Although a multitude of groups/cultures existed during this five-thousand-year span, material representations of the "Calf Creek culture" have been more thoroughly studied than other cultural complexes, perhaps due to the distinctive spear points and the people's adaptation to hot, arid landscapes. Calf Creek people subsisted during the height of an extremely arid and seasonally warm time (circa 5000 years ago). Their presence across Oklahoma at this time is well documented, despite harsh environmental conditions. They used large spear points, made with craftsmanship reminiscent of Folsom hunters, as well as a tool kit geared to hunting plains-adapted animals such as bison and antelope. Archaeologists have found Calf Creek cultural materials in many places around Oklahoma, including the Kubik site in Kay County, the Anthony site in Caddo County, and the Arrowhead Ditch site in Muskogee County. Calf Creek people favored high places with broad vistas, but there was also considerable diversity in the placement of settlements. Some represent temporarily occupied camps and possible bison kill locations, and others are places where lithic raw material is cached. Some seem to have been rendevous sites for the meeting of different bands of Calf Creek people. Still, all evidence points to a highly nomadic, loosely organized society. With the end of the period of hot, dry weather, there were dramatic changes in the context for people living in Oklahoma. Populations increased substantially, perhaps through natural increase and also perhaps because favorable conditions encouraged migration into the region. Native peoples' settlements now became more numerous, larger, and more permanently built. During this time of some 4000 to 2000 years ago, significant changes occurred in the character of prehistoric societies, and they became Hunters, Gathers, and Traders (recognized in past literature as Foragers or occupying the Archaic Period). With the increases in population, group mobility and access to resources became more restricted, and some of the first evidence for conflicts between societies appears. So does its alternative, exchange or trade. Greater concern with subsistence needs led to not only greater reliance on harvesting and perhaps cultivating plants but also to consistent storage of foods for periods of scarcity. Increased population, conflict, and plant cultivation necessitated more complex political and social leadership. During this time religious beliefs became more visibly expressed in formal, sometimes ritual treatment of deceased leaders and other important people. These interrelated agents of change brought about diversification in technology as well. Weapons and tools for processing animals and plants remained in common use, although there was a notable increase in tools for grinding seeds and nuts. Complex carbohydrates may have increasingly formed the staple base of diet. A distinction present at this time was the presence of true ornaments, some made of bone and shell; some may have signified greater status of the wearer. 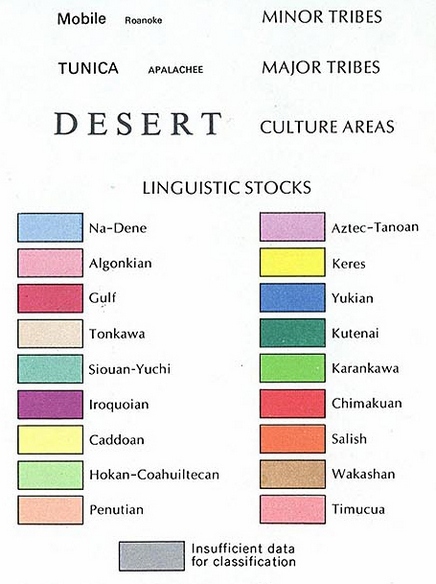 Approximately five hundred sites offer evidence of these diverse groups. In the eastern part of Oklahoma societies that lived north of the Arkansas River distinctly differed from those that occupied the region south of it. Whether these groups are ethnically distinguishable is unknown. Living south of the Arkansas River and north of the Ouachita Mountains, the "Wister culture" intensively occupied the area of Fourche Maline, San Bois, and Brazil creeks and the Poteau and Kiamichi rivers. These people lived in what has been called "Black Midden Mounds" and appear to have depended heavily on riverine resources. The situation in the west and in the Panhandle differed significantly. Here archaeologists have found large-scale, communal bison kills and some modest camps/hamlets. Settlements are much more dispersed and would appear much more dependent on a protein-rich diet derived from bison hunting. In the Panhandle, groups focused on streams, rivers, and seasonally inundated playa lake beds for hunting and perhaps collection of edible plants. Important places in this western version of Hunters, Gatherers, and Traders are the Certain Bison Kill in Beckham County, the Summers site in Greer County, and the Muncie site in Texas County. The fewer settlements in western Oklahoma and the Panhandle may reflect more the difference in subsistence practices than absolute numbers of people per group. 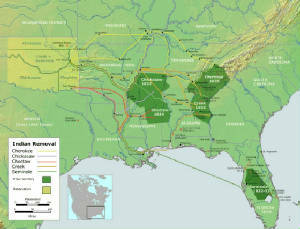 However, it is likely that many more Native peoples occupied the eastern part of the state at this time. During the time of the Hunter, Gatherers, and Traders a stable climate permitted groups to reestablish their presence in various regions. Rainfall increased in the next period, called Agricultural Beginnings (circa 2000 to 1200 years ago, which previous scholarship placed in the Middle Prehistoric period or identified as Early Farmers and in some localities as Woodland). Conditions of larger population, reduced mobility, and greater knowledge of plant cultivation catalyzed the true beginnings of agriculture. It is interesting, if not somewhat paradoxical, however, that Agricultural Beginnings may have started earlier in the west and central regions of Oklahoma than in the east, where populations were greater. Perhaps in southeastern Oklahoma societies could ignore plant cultivation because of the abundant resources of stream and river valleys. Throughout the state populations are thought to have continued some type of geometric population growth, along with decreasing mobility and an even greater dependence on edible plants. Social, political, and religious changes born during the prior time of Hunters, Gatherers, and Traders (conflict, social complexity, and religious practices) became more expressed and more widespread. Native groups continued to build and use storage facilities and constructed more permanent dwellings. The number of places containing expressions of these Agricultural Beginnings groups is greater than those for the preceding period, although not excessively so. Probably fewer than a thousand such sites have been documented. The pattern follows that identified for Hunters, Gatherers, and Traders, in respect to a north-south and east-west distinction. In eastern Oklahoma the Arkansas River again served as a boundary between cultural groups. To the north, in Delaware and Mayes counties, lived a distinct people, termed the "Cooper culture," that have relationships to groups occupying the Kansas City, Missouri, area some 1500 years ago. While the Kansas societies built mounds where their leaders were buried, no such earthworks have been found in Oklahoma. Thus, relationships to the Kansas groups are demonstrated in styles of spear points, ceramics, and clay figurines. Other indigenous groups also apparently lived in the area contemporaneously with the Cooper people. Both groups in northeastern Oklahoma used a number of rock shelters as seasonal camps. South of the Arkansas River and north of the Ouachita Mountains lived the Fourche Maline, a continuation of the Wister culture. The two life styles were very much alike, but the Fourche Maline people made important technological advancements with the bow and arrow, ceramics, and stone tools used in woodworking. Fourche Maline continued to occupy the "Black Midden Mound" locations, and their economy revolved around riverine resources. Along the Red River, other less well-defined cultures followed similar ways of life. In central Oklahoma, within a mixed zone of tall-grass prairies and woods of blackjack and post oak, there also existed some distinctions between Native groups in the north and in the south. In north-central Oklahoma, particularly in the Arkansas River valley in Kay and Osage counties, some societies had technological characteristics of the Kansas City people, generally in spear point and pottery styles. Archaeologists have found this cultural expression at sites such as Hammons, Hudsonpillar, and Daniels in Kay County. Other groups of roughly contemporaneous settlements manifested material culture more consistent with local developments and are thought to represent continuation from the previous Hunters, Gatherers, and Traders. Examples of these camps and hamlets include Von Elm and Vickery in Kay County as well as a few rock shelters in Osage County. Both groups of Native peoples made substantial use of plains-adapted plants and animals. However, these communities were probably diminished when rainfall increased and woodland encroached. In south-central Oklahoma other societies during Agricultural Beginnings lived in dispersed settlements, frequently on sandy terraces high above the alluvial valleys. Examples of occupations sites are Barkheimer in Seminole County, Gregory in Pottawatomie County, and Ayers in Marshall County. Due to the tremendous deposition of flood-borne soils, valley occupations are rarely found. Unlike their counterparts in other regions, these groups did not display as much evidence for decreased mobility and duration of stay. These south-central groups paralleled other Native peoples in their adoption of the bow and arrow, ceramics, and tools for woodworking. The western part of Oklahoma exhibited the greatest variability in Agricultural Beginnings. Some groups continued the communal bison hunts of Hunters, Gatherers, and Traders. In fact, these Native peoples may have changed little during the ensuing 1000 years. They continued to use well-made spear points to hunt bison and other game, and they potentially remained fairly nomadic. The Certain bison kill in Beckham County reflects this continuation. However, other groups had a more diverse orientation, hunting bison as well as other animals and collecting edible plants. These people used bows and arrows rather than spears and stored and prepared foods in pottery vessels. The Swift Horse locality in Roger Mills County is one of the best examples of this way of life. The pronounced difference in social and economic patterns in western Oklahoma was not always accommodated and occasionally led to conflict. Little cultural information exists for most of the Oklahoma Panhandle. However, in Cimarron County Native groups occupied a number of dry shelters during this period. These caves and shelters contained a wealth of information on these people's material culture of the people as well as on their counterparts in others regions. Objects collected from these camping sites consist of quantities of perishable items including woven sandals, rabbit-skin bags, woven bags, throwing sticks, and foreshafts of spears. Between 1200 and 550 years ago, Oklahoma was occupied by numerous societies of Native Americans called Agricultural Villagers who lived in settled communities and farmed. Known in some earlier literature as occupying the Late Prehistoric Period or as Village Farmers, these varied peoples continue the pattern that started during the Agricultural Beginnings period. Throughout much of the state, they lived in well-built, grass-roofed houses with vertically set, wooden-post walls plastered with mud. The exception occurred in the Panhandle, where houses were made with stone-slab walls or were dug below the ground surface ("pit houses"). Strategically placed near highly fertile soils but outside of danger from floods, settlements ranged from only a few houses (farmsteads/hamlets) to large villages of twenty or more. In some instances villages demonstrated evidence of a planned layout. At any given time, a village might accommodate up to two hundred persons. Population rapidly accelerated during this time, bringing about not only greater community size but also greater density of settlement. In some areas villages might occur as frequently as a mile and half-apart along favored stretches of river valley. In eastern Oklahoma another important architectural practice, in addition to housing, was the construction of a variety of earthen mounds. Some were temple mounds where priestly leaders resided, and others were burial mounds for political and religious leaders. In the central and western parts of Oklahoma archaeologists have found no mound construction, but this does not mean that the societies necessarily lacked religious complexity. (Map) Of the hundreds of Native American tribes that inhabited the Northern Hemisphere by 1800, only a handful would be viewed with reluctant acceptance by Europeans who had settled the land en masse. 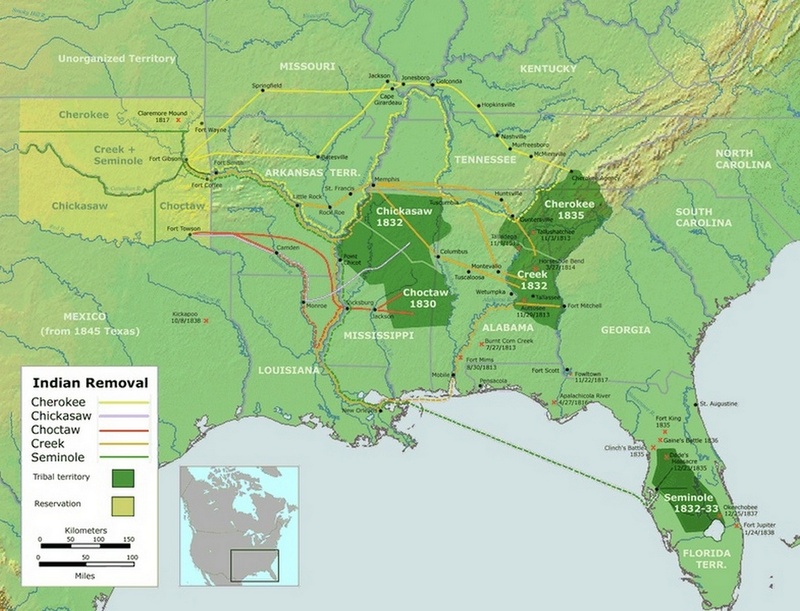 By the mid-19th century there were five tribes that had adopted many ways of the neighboring European settlers, and were therefore referred to as the Five Civilized Tribes. Although considered civilized, the Five Tribes were considered by Washington as incompatible with nearby white settlements. Through a series of 19th century Indian removal acts enacted by politicians at the nation's capitol, each of the five tribes would be forced to cede land continually until they were collectively removed and herded onto reservations on what was known as Indian Territory. The reservations were located on what Washington considered barren, waste land unsuited for white settlement and yet land far enough west to allow a buffer or neutral ground between whites and Indians. The Mid West, including Indian Territory, however, would soon succumb to Manifest Destiny as European settlers pushed west settling new land. Present-day Oklahoma masks or overlays much of the former Indian Territory. With the prospect of gold and silver out west, coupled with the Homestead Act, white encroachment on the reservations, the long promised lands for peace, would quickly force Native American assimilation with whites, again. Today, the five reservations are merely swaths of land within the State of Oklahoma. Although America's Indigenous peoples would see African-Americans become citizens with ratification of the 14th Amendment in 1868, the land's original inhabitants would wait until the 1924 Indian Citizenship Act to be extended the same right. During the past 750 to1000 years, subsistence also markedly changed. People increasingly emphasized certain edible plants in the diet, and plant domestication efforts expanded. By the time of Agricultural Villagers, tropical plants such as corn, beans, and squash as well as native species such as chenopodium, amaranth, marshelder, sumpweed, and sunflower were domesticated. By the late thirteenth century farming was a major enterprise, requiring field maintenance as well as coordination of field placement between different societies. Hunting continued as well, and a diversity of animals supplemented a carbohydrate-laden diet. In fact, some of the elite leaders of groups in eastern Oklahoma preferred to eat an alternative, healthier diet high in proteins and wild plants, rather than corn. In the west, Agricultural Villagers who were adapted to a plains environment invested much effort in hunting of bison and other plains animals. In the Agricultural Villagers period, technology, already highly sophisticated, expanded even more. The bow and arrow became a mainstay for hunting as well as a weapon in conflicts between groups. Because of the agricultural emphasis, stone tools, like grinding stones and basins for processing corn and other grains, proliferated. On the plains, agricultural activity brought into use numerous bone tools, including bison-bone hoes and digging sticks. Other bone items functioned as awls/needles, scrapers, beads, breastplates, and even whistles. While it had been only nominally decorated and had a minimum of forms during the preceding period, in the Agricultural Villagers period pottery exploded into a multiplicity of forms and stylistic expressions. Bowls, jars, plates, bottles, and effigy forms have been found. Decoration on vessels included incising, engraving, punctation, applique, as well as polishing. Pottery color no longer resulted from simple differences in firing. Slips were used to color the vessels, and glazes were used to change the character of the external and internal surfaces. Other mediums for material culture, including copper, crystal, and a variety of minerals for ornaments, also express this evolutionary acceleration. Textiles were widely used, but the difficulty of preserving these fragile materials limits a knowledge of the extent of use. Of particular note in technology is an increasing use of material goods in expressing ritual and religious concepts. Because of the increase in the number of settlements as well as their proximity to modern times, thousands of Village Agriculturalist occupation sites have been documented, especially in the Arkansas and Red river drainage systems. For some 650 years these people followed a life way adapted to an agricultural economy. At the same time, they developed a religious system tied to the lives and deaths of their priestly elite rulers. Mounds visually expressed their beliefs. In south-central and western Oklahoma lived Agricultural Villagers of the Redbed Plains tradition. Occupying sizeable settlements along the Washita, Canadian, and North Canadian rivers and the forks of the Red River as well as their feeder streams, these Native peoples practiced an intensive agriculture adapted to southern plains conditions. The intensity of farming practices exceeded that of their eastern counterparts. Their technology extensively used bison bone for agricultural tools. Domestic items such as pottery were less decorated than those found in the east. However, there was sophistication in the simplicity of their design of tools and ornaments. For example, sandstone abraders used in making bone tools were graded by coarseness, like modern grades of sandpaper. Important sites of the Redbed Plains are Arthur in Garvin County, Heerwald in Custer County, and McLemore in Washita County. In the Oklahoma Panhandle there existed people of the "Antelope Creek culture." This term refers to Native groups that lived along the upper reaches of the Canadian, North Canadian, and Arkansas rivers. Unlike other Agricultural Villagers, they built settlements of stone slab walled houses much like those in the southwest. Their ways of life paralleled those of the Redbed Plains villagers tradition. They maintained an economy based on agriculture and on bison obtained on long-distance, seasonal hunts. The Agricultural Villagers period marks the first time when prehistoric groups can also be linked to historically known Native societies (or "tribes:"). It preceded a new era that brought many turbulent changes and transformed groups in Oklahoma and elsewhere. Arriving in the mid-sixteenth century, Europeans brought many new elements, drastically altering the economies, political and religious systems, and basic ways of life of Native peoples. Foremost among these elements was disease. Measles, smallpox, and diphtheria nearly destroyed some "tribes" forcing survivors to join with other groups. Because of their more sedentary lifestyle, the Coalesced Villagers suffered more devastation from disease than did the Communal Hunters. Europeans also brought material goods, further altering Native society. The horse changed the nature of hunting as well as warfare. In combination with firearms, it revolutionized groups such as the Comanche, transforming them into "the warlords of the plains." Europeans used trade to pit one Native group against another and also tried to force the Christian religion on Native people. Against this background of turmoil, it is not surprising that the archaeological record of this period is poorly documented and even more poorly understood. As suggested above, two different patterns of life ways existed during this time. Some groups formed Coalesced Villages, living much like their Agricultural Villagers ancestors. However, the villages were much larger, holding perhaps five hundred to one thousand inhabitants. There is historic documentation to indicate that villages were seasonally abandoned while the occupants pursued bison herds for two to three months. Some villagers groups were highly mobile, maintaining portable dwellings (e.g., tipis) while following the bison herds across the plains. But even the Coalesced Villagers settlements exhibited less permanency than during the preceding period. For example, groups of the Wichita abandoned rectangular houses with mud/clay plastered walls in favor of circular grass houses. Throughout much of the region nondomestic architecture (e.g., mounds) construction was discontinued, although societies of the Caddo Confederacy continued to build mounds in Arkansas, Louisiana, Texas, and extreme southeastern Oklahoma. In the Coalesced Villagers/Communal Hunters period, the new economic specialization was expressed through technology. There was an increased emphasis on weaponry and hunting/processing of bison. Of particular note are large scrapers used in working hides, which were traded to the French, Spanish, and Americans. With the shift to greater emphasis in communal hunting, agricultural technology remains consistent with that found during the Agricultural Villagers period, although at lessened intensity. The principal technological change lay in the use and accommodation of European goods. Ornaments such as glass beads and metal bracelets and rings became items of status. Domestic goods such as metal hatchets, axes, knives, and firearms were used in a functionally consistent fashion. There were other goods, however, such as metal kettles and pots, that were hammered out as arrow points, knives, and scrapers, the original shape and function being accommodated to new forms and tasks. Meanwhile, Native domestic goods such as chipped stone tools (used as weapons and in the hunting and butchering of game), pottery vessels, and bone tools and ornaments continued to be used. Replacement of many of these items by goods of European manufacture would not be common until the 1800s. Although settlement, subsistence, and technology changed rapidly, the social, political, and religious systems were even more profoundly affected. Because European diseases caused great population reduction, societies endured large-scale realignment. Equally significant changes in political structure occurred because of pressure from European governments, which embodied a centralized leadership system with a governor or other singular figure in control. Diplomacy required Native societies to designate an individual to function in a like capacity, even though this form of political organization was totally alien to their own form of decision making. The interaction of Europeans with various tribes and in some cases, their marriage to tribe members, also caused considerable disruption in Native society. The other major area of European intervention into Native people's life ways came in the area of religion. Here, Christianity was impressed upon Native societies with the intent of eradicating tribal beliefs. Many Native groups tried to accommodate a new religious order while still treating their traditional religious leaders with the appropriate respect. In some situations this resulted in the abandonment of traditional religious practices and substitution of European ritual. While thousands of locations contain evidence of Agricultural Villagers, a much smaller number of places provide evidence of Coalesced Villagers/Nomadic Communal Hunters. Fewer than one hundred sites are proven as occupied either immediately prior to European contact or within 250 years of it. The best evidence for the configuration of pre-European Native societies exists in western Oklahoma. Throughout the western one half of Oklahoma, the "Wheeler culture" people lived at a number of village sites along tributary streams of the Washita or North Fork of the Red River. Some villages such as Edwards in Beckham County and Duncan in Washita County were fortified. Others in Caddo, Custer, and Canadian counties apparently had no such protection. There was some specialization by village: the more western may represent locations that were residentially used in seasonal bison hunts. Those further east, like Little Deer in Custer County and Scott in Canadian County, display no indications of palisades or other defensive architecture. Settlements of this time are probably related to various subgroups of the Wichita. Occupation continued until about 350 years ago. Following this, an even more restricted sample of villages, including the Deer Creek (Fedinandina) location in Kay County, Longest village in Jefferson County, Devil's Canyon in Kiowa County, and Lasley Vore rendezvous locality in Tulsa County, can be specifically linked by historic accounts to various Wichita subgroups. These sites also represent the only known places where archaeological evidence firmly establishes contact between Europeans and Native peoples. Following the Coalesced Villagers/Communal Hunters period, Native societies entered a time of even greater complexity with respect to culture change and interaction with Europeans. This is the 1830s, the time when many Southeastern tribes and groups were moved from the Midwest and Plains to Oklahoma. Well documented, this period is better addressed through the historical record. The story of prehistoric peoples' occupation of Oklahoma is a lengthy journey through time, one that is expressed with increasingly complex conditions of increases in population, diversification in technology, a more productive subsistence base, greater engineering skill in building, and different and more complex social, political, and religious beliefs. Time also holds witness to declines in society brought about by environmental conditions, the appearance of new Native groups in the region, and the arrival of Europeans. Thus, the Native peoples that are historically recognized in some ways bear little resemblance to their predecessors of the prehistoric past. Old paintings and photographs show the weapons held by their owners, giving both a time frame and a sense of their importance. The text is packed and yet very readable, and the amount of history, tribal distinction, and construction detail given in such a short book is astounding. This excellent introduction is a bargain for any library. Featuring 155 color photographs and illustrations, Native American Weapons surveys weapons made and used by American Indians north of present-day Mexico from prehistoric times to the late nineteenth century, when European weapons were in common use. Colin F. Taylor skillfully describes the weapons and their roles in tribal culture, economy, and political systems. He categorizes the weapons according to their function--from striking, cutting, and piercing weapons to those with defensive and even symbolic properties, and he documents the ingenuity of the people who crafted them. Taylor explains the history and use of weapons such as the atlatl, a lethal throwing stick whose basic design was enhanced by carving, painting, or other ornamentation. The atlatl surprised De Soto's expedition and contributed to the Spaniards' defeat. Another highlight is Taylor's description of the evolution of body armor, first fashioned to defend against arrows, then against bullets from early firearms. Over thousands of years the weapons were developed and creatively matched to their environment--highly functional and often decorative, carried proudly in tribal gatherings and in war. Recommended Reading: North American Bows, Arrows, and Quivers: An Illustrated History. Description: Otis Tufton Mason, the founder of the Anthropologist Society of Washington, details the history of the archery tools used by the native peoples throughout the North American continent. Hundreds of precise line drawings showcase the many varieties of bows, arrows, and quivers they crafted, and beautifully rendered images display tools and materials. Sketched diagrams demonstrate exactly how the arrow points were mounted and the bows assembled. Nearly all the illustrations are accompanied by an explanatory page of authoritative information, and Mason’s writing reveals his deep appreciation and admiration of the work he’s presenting and the people who created it. BIBLIOGRAPHY: Robert E. Bell, ed., Prehistory of Oklahoma (Orlando, Fla.: Academic Press, 1984). Leland C. Bement, Bison Hunting at Cooper Site: Where Lightning Bolts Drew Thundering Herds (Norman: University of Oklahoma Press, 1999). James A. Brown, The Spiro Ceremonial Center, Memoirs of the Museum of Anthropology 29 (Ann Arbor, Mich.: Museum of Anthropology Publications, 1996). Thomas D. Dillehay, The Settlement of the Americas (New York: Basic Books, 2000). Brian M. Fagan, Ancient North America: The Archaeology of a Continent (London, England: Thames and Hudson, 1995). Claudette Marie Gilbert and Robert L. Brooks, From Mounds to Mammoths: A Field Guide to Oklahoma Prehistory (2d ed., Norman: University of Oklahoma Press, 2000). Waldo Wedel, Prehistoric Man on the Great Plains (Norman: University of Oklahoma Press, 1961). Don G. Wyckoff and Robert L. Brooks, Oklahoma Archeology: A 1981 Perspective, Archeological Resource Survey Report No. 16 (Norman: Oklahoma Archeological Survey, 1981).